What Do The Colors And Symbols Of The Flag Of Burundi Mean? The flag of Burundi was adopted on 28 June 1967. 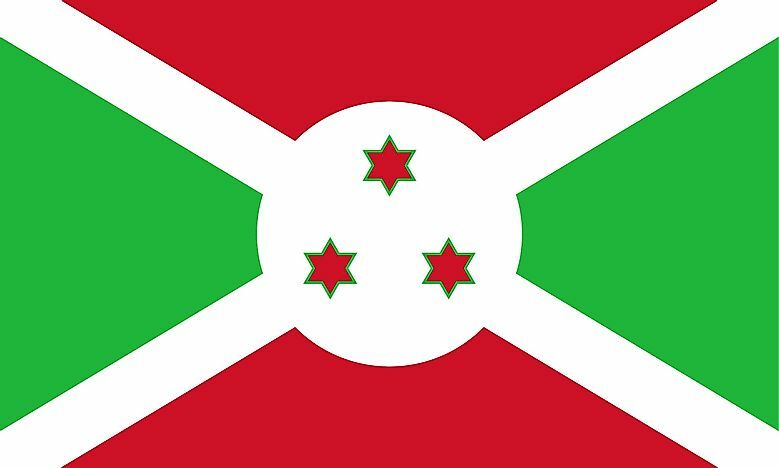 The flag of Burundi is one of the country’s national symbols. Burundi adopted its national flag on June 28, 1967, following the abolition of the monarchy system of government. Red, green, and white are colors that feature on the flag which is designed on a horizontal rectangle. The original dimensions of the flag were 2:3 for the width and length respectively, but a Presidential decree of 1988 directed that this was changed to a width-length dimension of 3:5. The description of the flag is explicitly described in Article 8 of the Constitution of Burundi, where it stipulates that the flag is rectangular and comprised of three colors (described as tricolor as in “made of three colors”). The legally accepted proportions of the flag are 3:5 for its width and length respectively. The flag’s top and bottom are made up of two red triangles, while the hoist and fly feature green triangles, with the two being separated by a white diagonal cross. At the flag’s center is a white circle that is superimposed at the saltire’s center and incorporated on it are three red six-pointed stars. The red color represents the blood that was shed during Burundi’s struggle for independence that culminated in the country’s independence from Belgium in 1962, as well as the courage of the freedom fighters. Green symbolizes the optimism the citizens have of the nation’s economic growth in the future, while white is said to represent peace. The three green stars represent the elements of the national motto of Burundi, “Unité, Travail, Progrès.” The motto which is seen on Burundi’s national emblem is a French phrase that translates to “Unity, Work, and Progress.” The three stars on the flag’s center can also symbolize the loyalty the citizens originally pledged to God, the country, and the king. Another translation states that the three green stars represent the nation’s three main ethnic communities of the Hutu, Twa, and the Tusti. There was a movement in the early 2000s in Burundi to have the three red stars removed from the design of the flag due to their representation of Burundi’s main ethnic groups. The campaigners behind the movement stated that the symbolism of the stars was divisive and was being used by extremist Tutsis to stir tribal animosities. There were claims that these extremists used the symbolism of the stars (which have a resemblance to the Star of David) as proof of their Judaism lineage. However, foreign powers including Britain and the United States discouraged Burundi from removing the three stars from the flag. Burundi was once a German colony in the late 19th century and the early 20th century and during this period the flag used was that of the German East African Company. After the Great War, Burundi became a Belgian colony according to the Treaty of Versailles, and the German East African Company flag was replaced with that of the Belgian colony. The country gained independence in 1961 and immediately adopted a new flag whose design resembles that of the current flag but had a traditional “karyenda” drum propped by a sorghum plant. The traditional drum was a royal symbol and therefore represented the monarchy. The flag was used until the monarchy was abolished in 1966.